Woodsmith No, 227- "Revolutionary routing: PowerLift Pro." Excerpts from the Woodsmith No. 227 "Great Gear" article. "With their new PowerLift Pro, MLCS has taken the concept of a router lift to a new level. The PowerLift is similar to other lifts but has two key additions: A motor that mechanically raises and low-ers the router, and a digital readout that allows you to monitor and adjust the bit height. And these additions will change the way you look at router lifts." "AN APP FOR THAT. With just the foot pedal and control box, you can raise and lower the router mechanically. But what really makes this router lift unique is the PowerLift Pro app. Avail-able for Android phones and tablets, this app adds a ton of functionality to your router lift." "The app allows you to adjust the lift by pressing buttons on the screen. You also can control the speed of the lift motor. But the most important thing it does is provide an accurate measurement of the bit height." "But, perhaps most uniquely, the hands-free nature of the lift also allows you to perform operations that were difficult or impossible before. For example, you can cut mortises or stopped dadoes by raising the spinning bit into the workpiece with the foot pedal and holding the workpiece securely with both hands. " Shown: The PowerLift Pro installed. "The PowerLift Pro's motor connects to a threaded rod with a belt, letting you raise and lower the router mechanically." "A foot pedal lets you raise or lower the router bit while you hold the workpiece securely with both hands." 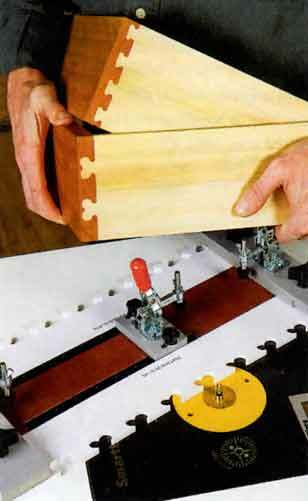 Woodworker's Journal reviewed the MLCS Fast Joint Precision Joinery System in the Winter 2014 issue. "Want to add some flair to your half-blinds? Here's a jig that will make the conventional wedges, as well as key-and heart-shaped joints, just by switching between interchangeable templates. Fast Joint will do through dovetails, too. The company also sells a variety of other templates as accessories to expand the options further. Here's how it all works: the jig consists of an "H"-shaped platform with stops and toggle clamps on each end. Pin and tail templates bolt in place on opposite sides, which also registers their offset. For half-blinds, you cut the joint pins by standing the workpiece against a right-angle fence that clamps to the jig base. The tail slots are milled with the board lying down and clamped. Both pins and tails are milled with the board lying down and clamped. Both pins and tails are cut vertically for through dovetails. All the milling happens on the router table, using guide collars and bits that MLCS supplies with the system. In fact, MLCS provides everything you need — even spring clamps! — for a convenient, all-in-one package. 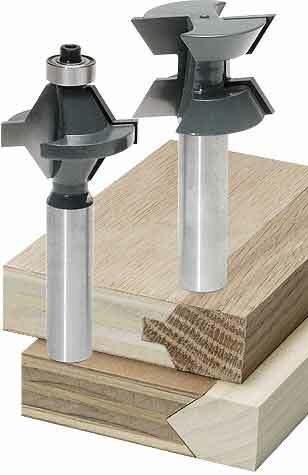 Fast Joint will rout boards up to 14" wide in stock from 1/4" to 3/4" thick; through dovetails are limited to 3/8" or thinner material. This jig took me longer to set up and learn than some others. But, its manual is well written and clearly photographed to explain the step-by-step process. Keep it in a safe place for a refresher course if you don't rout dovetails very often. Fast Joint worked well for me, because the guide collar and templates minimize the setup variable that could complicate the process.You'll need to set bit heights carefully, and you may need to make spacer blocks to position workpieces on the jig in order to create a centered pattern. I wish the templates were made of a more durable material than PVC; they will flex slightly when pressed hard against a guide collar. But that really didn't impact accuracy or joint fit. All in all, $170 seems a good bargain for a jig that makes four joint styles right out of the box, with a nice bunch of extras. 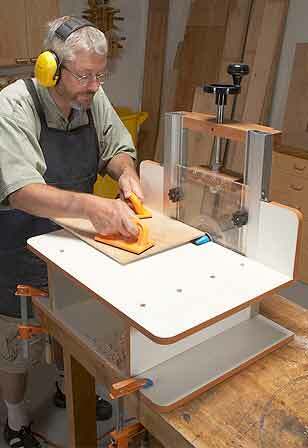 A wide jig base faced with sandpaper and three supplied toggle clamps hold workpieces securely for router table use. A right-angle fence mounts on the jig to rout pin boards vertically. Fast Joint's interchangeable templates come in several decorative styles. They will add a whole new dimension to your corner joinery. "Unique in that height adjustments are made from the side of the table." Woodsmith reviewed MLCS U-Turn Router Lift in their No. 212 issue. "Most router lifts work in essentially the same way. But the new U-Turn Router Lift is unique in that height adjustments are made from the side of the table. This offers a couple of advantages when using your router table. For one, you can leave the handle in place while using the table, so you don't have to worry about misplacing it when it's not in use. Also, the side-mounted handle makes it easy to make adjustments with the workpiece on the tabletop. When you're trying to "dial-in" the router bit height to match a mark on the actual piece, this lift offers an unparalleled advantage. In use, the U-Turn is an impressive router lift. The construction is rock-solid, and it's attached to an aluminum insert plate. The height adjustment is easy to make, and the handle turns smoothly and steadily. It's definitely worth a look if you're in the market for a router lift. 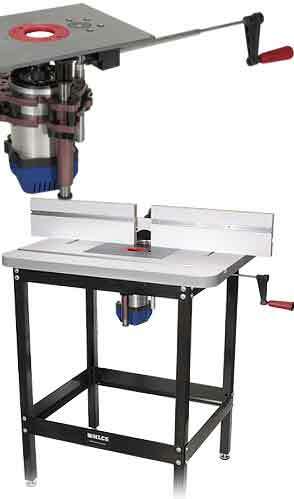 Plus, MLCS even makes a version of the lift that will fit in other manufacturers' router tables." 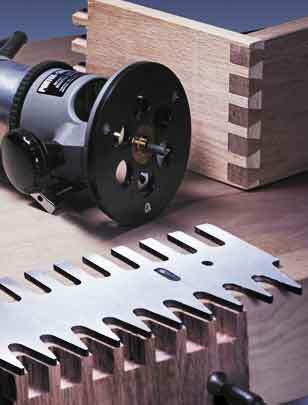 "Blend hardwood edging seamlessly with your project's plywood... using a pair of router bits..."
Woodsmith reviewed MLCS Edge Banding Router Bit Sets in the November 2013 issue. "Hiding the edges of plywood is a challenge that woodworkers have faced since the invention of the material. 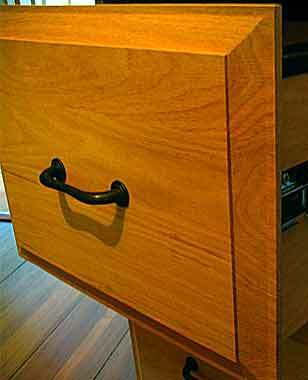 Simply put, plywood makes building large cabinets easy, but nobody wants to see those exposed plywood edges. So covering them up with a thin strip of hardwood is the typical solution. The only problem is, getting that edging to align and blend seamlessly with the plywood can often be challenging. 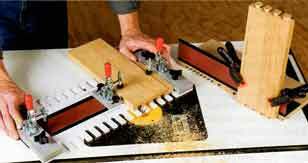 The edging has a frustrating tendency to slip around on the plywood as you apply clamps to it. And no matter how good you are at choosing hardwood that matches the plywood, the seam between the part and edging is often still visible. EDGE-BANDING BITS. 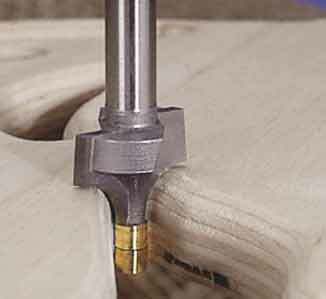 One way to achieve better results when you're joining hardwood edging to plywood is to cut the mating parts with edge-banding router bits first. These bits create mating profiles in the plywood and edging. The end result is an interlocking joint that's sure to align. Then, once the joint is assembled, you can cut the edging off flush with the plywood surface or rout a profile on the edging to make the joint line virtually disappear. With proper setup and cutting, the profiles in the hardwood and plywood should fit together like a hand in a glove. Once the glue dries, the last step in completing your parts is to rip them to final width. And thanks to the joint created by the router bits, you have the option of trimming right up to the edge of the plywood and creating an invisible joint. Of course, you can also add a decorative profile to the edging to blend it seamlessly with the plywood. These edge-banding bits have found a permanent home in my router bit collection, and once you give them a try, I think you'll feel the same. After you get accustomed to setting up and using them, they'll add a seamless, professional touch to your plywood projects." "Cabinet capability in a box"
The MLCS 6-Piece Pro Cabinetmaker Bit Set comes with a nice wooden box for storing the bits when not in use." 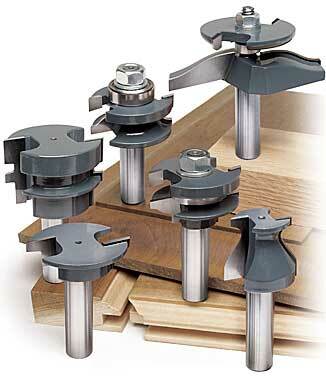 Review of MLCS TripleWing™ Router Bits from Workbench Magazine, August 2006 issue. "While two-flute bits can leave cutter marks and 'waves' on edge profiles, these three-flute bits produce consistently smooth cuts." "In the last few years, you've probably noticed how razors have gone from three blades, to four, and now to five. Well, now it seems that router bits are following suit. These new TripleWing bits from MLCS have three cutting edges and a claim of "smoother cuts and longer life. When I compared these bits head-to-head with two-flute bits, the improvement was noticeable. For example, a two-flute roundover bit produced an uneven profile, while the three-flute bit left a smooth surface. And since the bits have three cutters, rather than two, sharing the wear, their claim of longer cutting life seems valid." "Verdict: Priced the same as two-flute bits, they're worth a try." "Router bits you've never heard of... but you'll really want to try!" Review of MLCS Screw Slot Router Bits from Woodworkers Journal, Nov/Dec. 2008. Screw Slot Bits... Making slots for screws — rather than simply drilling around pilot holes — is sometimes essential to allow for wood movement or for adjustability. But making those slots can be really putzy. Did you know you can get a router bit to cut those slots? Two, in fact: one to make a slot with a countersink for a ftathead screw, another for a counterbored slot for a roundhead screw. Both are porportioned for #8 screws. Use the bit in a plunge router (or in a table-mounted router) to cut a slot in one quick operation. Clean slots for #8 screws are a job for the router, not the drill press. One bit cuts the slot and a countersink... the other makes a slot with counterbore. Use a plunge router to make blind slots." "Brass Piloted Bits - Sneaky Smooth"
Review of MLCS Brass Piloted Router Bits from Workbench Magazine. "Bits with metal pilots were around long berfore bearing-guided bits, but you don't see many anymore. That's because the spinning pilots would burn the wood. MLCS revamped the idea with a brass pilot that runs cooler. This small pilot lets you rout into tight spaces and inside corners." "The small pilot on this roundover bit sneaks right into the corner of a frame to create a smoother transition." "Verdict: A specialty bit, but priced around $20, they're worth a look." 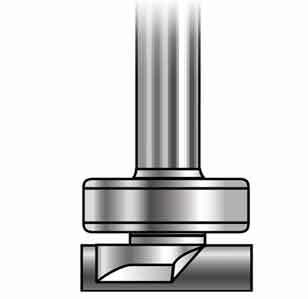 "Katana® Router Bit - First Experience"
Review of MLCS Katana® Raised Panel Router Bit with 18° bevel posted on Fine Woodworking "Knots" discussion board, by Matthew Schenker on October 2005. He also included the photos at right. "I thought you might like to see this review I posted about a Katana® router bit I just bought. Great quality! A little while back...some people asked about Katana. I said I was buying one and would report back. Here's the story...I've had good success with MLCS in the past, so when I had a file-cabinet project to do, I thought I'd give the Katana® Raised-Panel bits a try. The cabinet is made of oak.The one I bought is Item #18686, an 18-degree bevel with a 3" cut diameter, 5/8" cut height, and 1-1/4"; cut depth. I used it to create the edges on the oak drawer fronts. The drawer fronts are 16" wide x 12" high. I'm pretty comfortable around my router table, but I'll tell you I was nervous with this bit! Three-inch diameter is pretty large! I set the speed on my router as low as it will go. I set the fence back so the stock would just kiss the bearing. The first pass was 1/8", then I raised the bit height 3/32" for each subsequent pass, and I pushed the stock through slowly. I did a total of five passes (the first one plus four following ones) to get the final profile. Because of the profile, certain parts of the bit do not make contact until the third pass.The bit never burned the wood. There was absolutely no chipping or tearing of the oak. It felt very smooth. I ran two test pieces, and I got no tearout, even when I ran the end grain! I did another couple of test pieces, because I couldn't believe this. But it was true. I could run the drawer fronts through the bit, with no edge-grain tearout, which meant I could final-size the drawer fronts and rout all four edges in one operation! The bit really performed very nicely, and I was impressed by the quality of the cut. I would not hesitate to buy another bit from Katana®. Here's a link to the page for this bit: #18686." This excerpt is from Woodsmith Magazine #151 titled "Getting a Flat-Bottom Dado" . The cuts were made using MLCS Dado Clean Out bits. "Best (Flat-Bottom Dado). 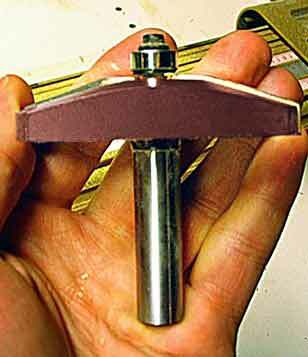 To get the tightest, best-looking dado joint, use a dado clean-out bit in a hand-held router. The top-bearing bit is guided by the sides of the dado. So how do you (cut dados)? I've found the best solution to be a combination of a hand-held router and a table saw...The secret behind this technique is an inexpensive router bit. The bits are called dado clean-out bits. And as the name implies, they have only one purpose and one purpose only-to cut perfectly clean and flat dadoes. To do that, the bottom of each bit has two cutting flutes that are ground dead flat. But what makes them different is that the carbide-tipped flutes are short (only 3/16")... Making the cutter length so short reduces the vibration, giving you a cleaner cut." 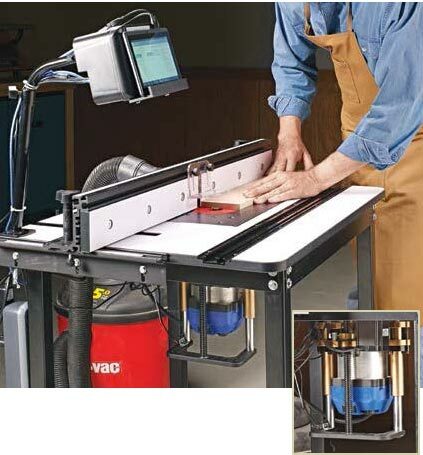 "A safer way to cut panels and moldings with vertical bits"
Review of MLCS Horizontal Router Table from American Woodworker Magazine, October/November 2008, Issue #138. 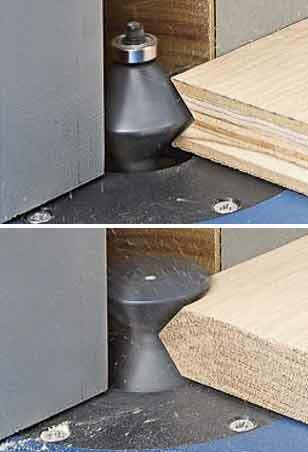 Vertical bits for raised panels and moldings eliminate the need for a variable speed router. These bits are much smaller in diameter than horizontal bits, which must be slowed down for safety. But vertical bits can be awkward to use. You must hold a tall panel against a short fence while balancing the panel on its narrow edge. That's tough to do, even with featherboards. The Flatbed Horizontal Router system from MLCS has turned the tables on the whole concept. Its horizontal table flips the normal positions of the router and fence. Now you can feed the panel into the bit while enjoying total support. I spent about two hours assembling the table. The instructions were a bit sketchy and led to a couple do-overs (I could have been a more careful reader), but there were no major setbacks. Once assembled, the table worked great. One thing that's different from what I'm used to is feeding the stock from right to left, the opposite direction from a standard router table. Height adjustments are quick and easyone turn of the crank equals exactly 1/16" of bit travel. So, a 1/4 turn gives you accuracy to within 1/64". I wish the crank was larger, though, so it would be easier to turn. The 20"x 24" table provides plenty of support for raising large panels. The table works for mortising, too. I found it best to take light cuts when cutting deep mortises because the router mounting plate can flex. If you really need to make heavy cuts, use a couple C-clamps to hold the plate steady where it's not attached under the table. A second set of hold down knobs below the table would be a nice addition to an otherwise fine product." Perfect 5 Star rating from Wood®! 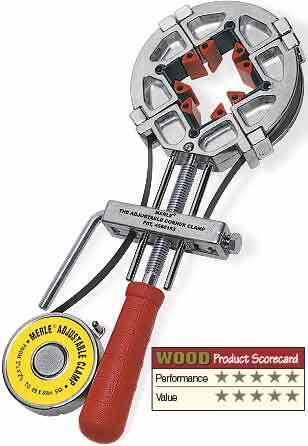 Review of Merle Band Clamp from Wood® Magazine, Winter 1997 Issue. The Merle received a perfect "5 STAR SCORE" for Price and Performance in the "Products That Perform" section. 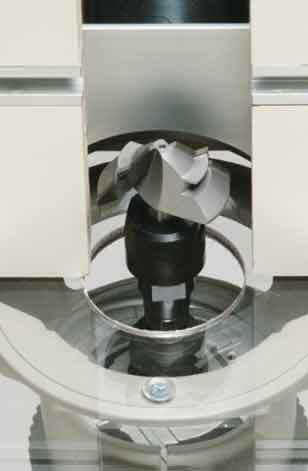 Tester Chuck Hedlund wrote: "Merle Clamp puts the squeeze on workpieces. When I recently built a laminated work surface, I needed to put some extra clamping pressure on the mitered banding around the top. I tried a nylon band clamp, but the nylon strap stretched too much to be effective. The solution was the Merle Adjustable Clamp, which uses a 3/8" wide spring steel band instead of a nylon strap. Similar to the tempered steel used for pallet tiedowns, this band won't stretch and helps you put tremendous clamping pressure around the perimeter of a frame. And unlike a nylon strap, glue won't adhere to the steel band - dried on drips pop right off. The clamp comes with cast-aluminum right-angle corner brackets that concentrate the band's pressure. With a bracket on each corner, you snug up the band, and tighten down a clamping bar to hold it in place. Then you twist the plastic handgrip to apply the neccessary clamping pressure. The clamp has convenient circular case with a crank handle so you can rewind the band for storage. It comes with a 22' band. An optional 40' band sells for $7." "Pins and Tails jigs deliver through dovetails for the price of a half-blind jig"
"Pins and Tails jigs ($80 each) cost only about half as much as the least-expensive model originally reviewed"
Instructions for the Pins And Tails Through Dovetail Templates are available on the MLCS Instructions page. 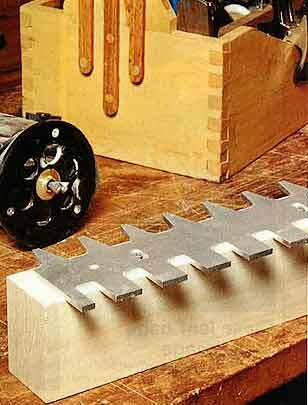 "I Love My Dovetail Jig"
Reprinted from, and appeared in the March 2014 issue of Home Handyman Magazine®. "If you'd love to be able to create dovetail joints but don't have the patience to learn to do it by hand or the money to buy those crazy-expensive dovetail jigs, this Pins & Tails Through Dovetail Template is your answer. I use mine to make storage boxes, and I used it to join the sides of my tool tote, as shown here. The sturdy cast aluminum template guides your router to make classic "through" dovetails (the traditional type where joints show up on both sides of corners). It's not complicated and requires a one-time-only but somewhat time-consuming setup. But when I got it figured out, I cut pins and tails all day long in 1/2-in to 7/8-in. stock, no matter how wide the workpiece. One side guides the tail cuts; the other, the pins. Whenever I want to dovetail, I just install the bushing and bit in the router, set the cutting depth and start dovetailing. The template comes with instructions and the bits and guide bushing to fit most router bases. It does take some fussing to set it up, but you can't beat the price at $50, much cheaper than more elaborate jigs. Check it out at mlcswoodworking.com. The No. 8712 is for 1/2-in. router shanks; the No. 6412 is for 1/4-in." OnPoint Laser Router Plate is a Wood® Magazine "Hot New Tool"
Review of OnPoint Laser Router Plate from Wood® Magazine, Dec/Jan 2008 Issue. 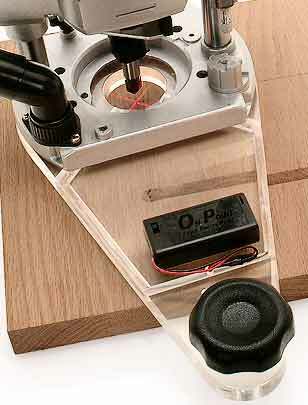 The On-Point Universal Laser Guided Router Plate with LED lIghts was voted one of "15 HOT NEW TOOLS FOR 2008". The laser red "X" marks the spot with this router subbase. 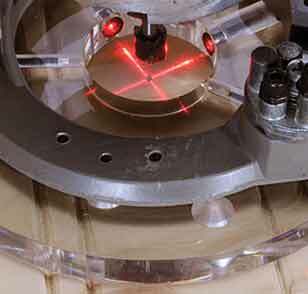 MLCS's On Point Laser Guided Router Base shines a laser crosshair to show the exact center of the bit. That's handy when freehand routing or setting up field cuts, such as fluting. Plus, it's oblong shape and outboard handle make it more stable for edge-routing. For cuts not requiring the laser, switch on the bright white LED worklights; combined with the clear subbase, they provide great bit visibility. 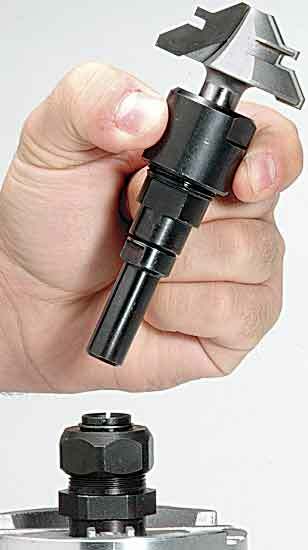 On Point comes predrilled to fit many popular midsize and 3-hp routers, but can be drilled to fit any." "Now that I've used it... I'm a believer." Review of OnPoint Laser Router Plate from September 2007 American Woodworker. Lasers seem to be everywhere in the shop these days. Thanks to the folks at MLCS, routers are no exception. The new OnPoint Laser Router Plate... contains laser cross hairs that helps you perfectly position your router for plunge cuts. I have to admit I was skeptical when I first saw this product. But now that I've used it to cut some dadoes and mortises, I'm a believer. The cross hairs do a great job of simplifying a joint's layout. You just have to remember that with the OnPoint plate your layout must be based on the center of the plunge cut, not the joint's edge. To mount the OnPoint plate to your router, you install a V-bit in the machine. Then, to align the lasers with the tip of the bit, you mark out and drill the screw hole locations for your router's base. This... needs to be done correctly to make good use of the cross hairs. Take your time and make certain it's right. From then on your router will be perfectly sighted in." 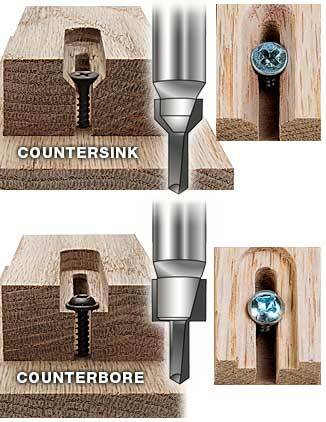 Review of MLCS Router Collet Extension from Fine Woodworking December 2002 issue. "Collet Stretcher. The router collet extension from MLCS adds about 2-1/4" to the length of a router collet, a handy feature in the router table for above-the-table bit changes." "When a router is mounted in a table, the collet of the router often ends up positioned well below the surface of the table, even after the motor has been raised to its maximum height. That means some bits are not able to reach far enough above the table to provide the full depth of cut." "Recently, MLCS began selling a router-collet extension that quickly remedies the problem. Also, as I quickly discovered, the extension makes bit changing a lot easier because the extension, which adds 2-1/4" in length, allows the collet to be raised well above the table. With the collet exposed it becomes relatively easy to work a pair of wrenches and change a bit. ""If you use a router table a lot and regularly struggle to install bits, the router extender might be worth a closer look." Review of MLCS Router Collet Extension from Wood® Magazine March 2003 issue. This accessory has a 1/2" shank on one end and a 1/2 collet on the other, and it installs just like a router bit. Once it's mounted, you insert your bit into the collet, tighten it as you normally would (you'll need a 1-1/6" open or adjustable end wrench) and begin routing. I measured .006" of rounout (wobble), but detected no increase in vibration or chatter when routing red oak (the router itself contributed less than .001" of runout). As a bonus, with the Router Collet Extension installed, I found it was easy to change bits from above my router table. 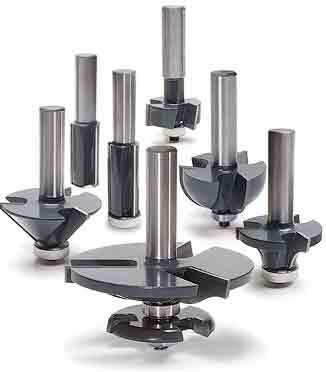 A few words of caution: Extending your router's collet puts extra stress on the tool and its bearings, so take multiple passes on stock, especially with large-diameter bits. (MLCS recommends using bits no larger than 3-1/2"). And you may find that the extra 2-1/4" of height is too much of a good thing, if your router's vertical travel won't let you lower the bit enough to cut properly. When that happens, the Router Collet Extension comes out as easily as bit.